How to make your Airtel Unlimited Tariff recharge free? yes it's right now you can make a free recharge of your Airtel Mobile Number and that must be the unlimited plan. Just have the patience and read the full topic and we will show you how to make your recharge amount free with 100% cashback on your recharge. Let's have a basic idea, why we called it's free and the answer is, if you recharge with any unlimited packs (minimum Rs. 399) on your Airtel mobile using the My Airtel Android application, for example if you recharge with Rs. 399 then you will get instant cashback of Rs. 400 as gift Coupons, each Rs. 50, which can be used on recharging of any other Airtel number and the minimum the recharge amount must the Rs. 399. 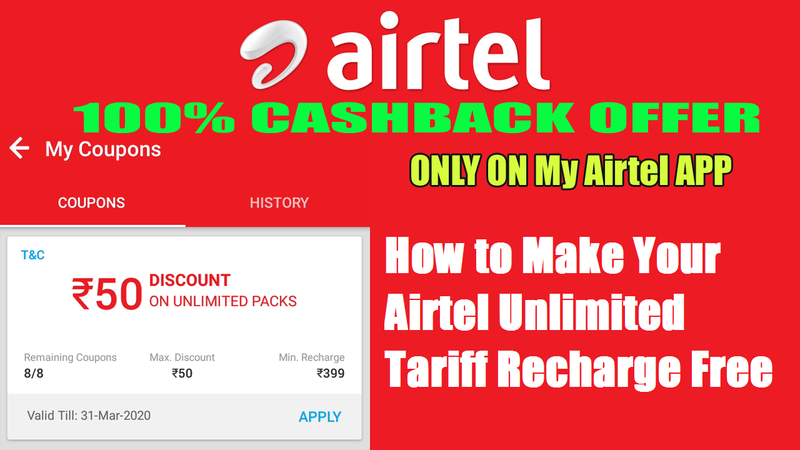 So let's know the complete process to get the 100% cashback offer from Airtel, first thing you must have an Android smartphone with My Airtel application installed, and Internet connection required to use the application for recharging the unlimited pack using and one more thing you must have the recharge amount on your My Airtel Account. Now recharge an Airtel number with Rs.399 and you will receive discount coupons of Rs. 400 each value Rs. 50. How to Get Rs. 400 Cashback On Your Airtel Recharge? You will get Rs. 400 cashback on your My Airtel Account as Gift Discount Coupons. You will receive total 8 Coupons or Rs. 50 Each. When you recharge other Airtel Number with Minimum Rs. 399 you can use only one Coupon at once. Like that you can recharge 8 different Airtel number to get the Rs. 400 cash back. Why We Called It's Free? This is free, because after recharge you will get cashback of Rs. 400, just use the 8 coupons to recharge other Airtel number, you complete the 100% cashback offer from Airtel. If you have friends or relatives with Airtel Mobile number then you can easily get your cashback very fast. So why are you waiting for just recharge today to get 100% cashback on your Airtel Mobile and follow the above process to complete 100% cashback process from Airtel and enjoy your subscription for Unlimited call and Internet free with Rs. 399 unlimited tariff. If you are eligible to get the offer then you will received a message after recharge of the unlimited pack, saying that "Congratulations! You have unlocked 100% cashback with 8 coupons of Rs. 50 each. Use these coupons on next recharges with My Airtel App". How To Check The Cashback Coupons? To check your cashback gift coupons after recharging the unlimited pack of Rs. 399, open your My Airtel app and scroll down a little bit and you will get an option My Coupons where you will get the full details of the Gift Coupons and you will also know the valid period of these coupons, Remaining Coupons and the recharge amount and the maximum discount amount. How to Use Airtel Gift Coupons? Once you receive the Gift Coupons from Airtel, then you can use these coupons on recharging of other Airtel numbers and you can use only one coupon for one recharge and the minimum recharge amount must be Unlimited pack of Rs. 399/-. This is so easy to use the Airtel Gift Coupons, just open the My Airtel application and then enter the Airtel Number and proceed to make payment, and there you will see the net amount to paid by you after automatically using the Airtel Gift Coupon of Rs. 50/-, for example if you choose the Rs. 399/- plan then after discount you need to pay Rs. 349/- and you will have the same tariff of Rs. 399, which is the unlimited pack from Airtel. So enjoy the new exciting offer from Airtel, which is 100% cashback on your unlimited pack recharge and can the cashback gift coupons can be used on any other Airtel number recharge with the unlimited pack of minimum Rs. 399.